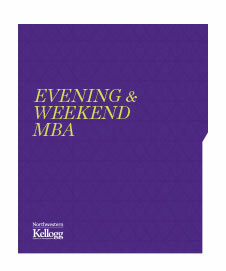 Thank you for your interest in the Evening & Weekend MBA Program at the Kellogg School of Management. The Viewbook you requested by mail should arrive within 7-10 days. By requesting this information, you have just taken an important step toward advancing your professional development. Attend an information session to learn more about the program and talk with current students and alumni. Evening & Weekend MBA Program, please call us at 312.503.8385.